John Webber was the artist on Captain James Cook’s third voyage to the Pacific and New Zealand. 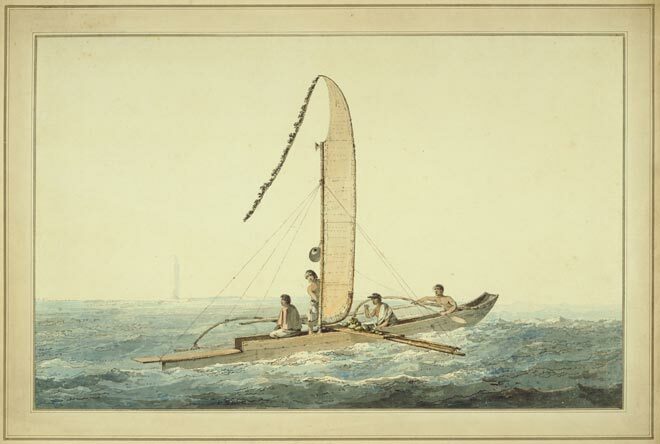 This watercolour, painted about 1777, shows a canoe from Tahiti (‘Otahaite’) with a lei hulu (feather pennant) flying from the tip of the boom. As the wind changed direction more than the swell, pennants of feathers and palmetto bark were constantly watched, and the sails trimmed and vessel steered accordingly. The navigator attempted to hold the wind at a constant bearing to the canoe. Other Polynesian sailors used similar wind indicators.